BMW hack - fact or hype? In recent days BMW have made the headlines. Experts from ADAC (the German Automobile Association) announced that they have managed to 'hack' BMW's ConnectedDrive - but is this true and if so, should we be worried? Hickleys, one of the leading Auto locksmith and diagnostics specialists will be displaying all their products at the show and as usual there will be some tremendous deals to grab on the day. Our range of market leading diagnostic testers including the MVPPro and Zedfull and our range of key cutting machines including Futura, Ninja, Miracle 6 & 9 electronic machines and the An-san duplication machines will be on demonstration by our specialists, this will enable you to consider and compare your options whilst receiving great advice. According to a new report released by US Senator Ed Markey: 'Security & Privacy Gaps Put American Drivers at Risk' highlights that only two of 16 major automotive manufacturers were able to "describe any capabilities to diagnose or meaningfully respond to an infiltration in real-time." Therefore, almost every new car on the market includes wireless technology that makes it vulnerable to hacking. Senator Ed Markey's revelation comes only one week after experts from ADAC (the German Automobile Association) announced that they managed to hack BMW's ConnectedDrive. A new startup accelerator based in London hopes to be the launchpad for a new wave of cyber-security technology companies from across Europe. The first 13-week programme for Cyber London (CyLon) will kick off in April, with a group of startups drawn from industries including defence, retail, telecoms and health services. A health board has become the first in Wales to issue body-worn cameras in a bid to cut down on violent attacks and abuse of staff. The Cardiff and Vale University board says a quarter of all attacks and incidents in Wales happen to staff on its sites. Ian Elverson has joined Securikey in the role of Account Manager for London and the South East, expanding the company's growing team of sales representatives and further strengthening Securikey's position as a leading UK supplier of physical security products. Ian is responsible for all accounts in the South East area, acting as their first point of contact, updating them on the latest product developments and point-of-sale tools and ensuring all queries are dealt with as quickly as possible. He is also responsible for identifying new business opportunities so that Securikey's comprehensive high quality security product range is available to even more potential customers in the industry. The annual Lockexpo, sponsored by Tradelocks is less than 3 weeks away on the 7th and 8th March 2015. The Venue is East Midlands Conference Centre, Nottingham University. NG7 2RJ. As well as an all day bar, hotel on site and free parking, we will again have the gallery open as a food outlet, sandwiches, breakfast rolls, beefburgers with and without cheese and hot meals will all be available at reasonable prices. Don't forget the training sessions: these are available on the website on a first come basis- even the free seminars have to be booked, so we do not overcrowd the rooms. If you have never attended please register - if you have been before get your QR code it really does speed entry. Parking is free everywhere at the weekend on the campus site, even if the car park is full. made drill bits with patented 'Blu-Tec' coating for greater heat resistance and longer life of the drills. 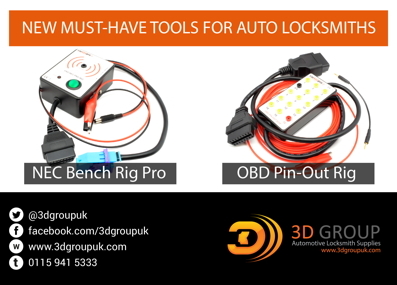 The Abloy Protec drill plus the solid Tungsten Carbide German 'Locksmiths Drill', amongst our new products. If you are having problems drilling locks, why not visit our stand and have a look at some of the solutions we have? Keyprint is a leading supplier to the Locksmith, Architectural Ironmonger, Hardware, Heel Bar, Key Cutting, Security and OEM trade for over 30 years. Our business has been built over the years with excellent relationships, service and knowledge of products that we supply to our customers. Allegion creates confidence for the benefit of a world that seems to grow ever more unpredictable. We do so with a continued concentration on safety and security; backed by a team of strategic brands that have stood atop their respective fields for well over a century. Through this combination of experience and focus, we reassure customers and investors that choosing Allegion is the soundest of decisions with our wide portfolio including Door Controls, Exit Hardware, Mechanical Locking, Steel Doors, Automatic Doors, Electronic Locking, Time & Attendance, Service/Maintenance and Portable Security.